Some quick fashion notes… Truth is still having a sale but probably not for much longer and it’s absolutely worth visiting because hair packs are only L$ 50 which is such a dirt cheap price for hair. 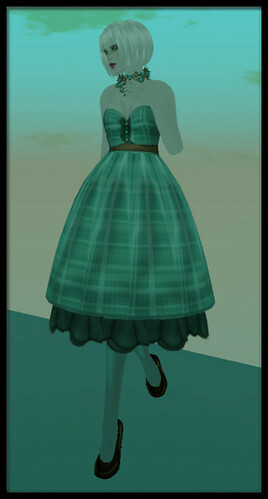 And the dress is free at Big Booty Big Money right now, also worth grabbing. And the jewelry by Tekeli-li is really fantastic.. I’ve shown off the weaponry before but I have to say the jewelry is of the same fantastic quality, and the best part, it’s scripted to color change and has a ton of options making it super customizable. This entry was posted in Fashion and tagged BBBM, LoTD, Periquita. Bookmark the permalink. You should post that one to Fab Free because they would love that one.. nice dress.. I have a few from BBBM.. but some where incomplete when I opened them, for some odd reason, and they also had some cute poses and animations when they had their free dresses as well..
I’ve loved everything I’ve purchased at BBBM… I need to take a picture of this one particular dress I really love from there.. even though they no longer sell it.